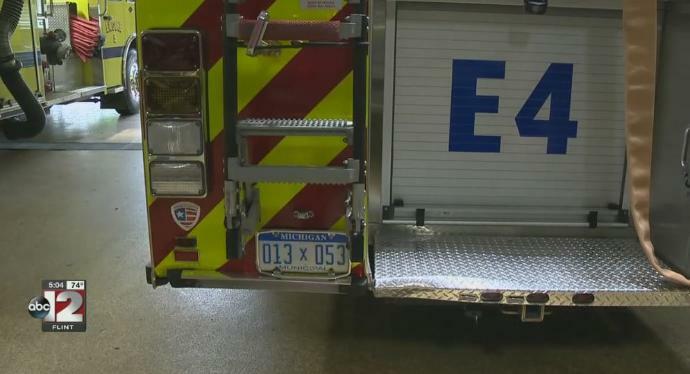 A Bridgeport Township fire crew escaped injury when their truck got rear-ended at the scene of a crash on I-75 Monday afternoon. The yellow engine with all of its warning lights activated was sitting in the emergency lane in the median outside the travel lanes on the southbound when an SUV drove into the back. Fire Chief Pat Nelson was in the truck that got hit. Neither he, the other firefighter traveling with him nor the woman who rear-ended them received any injuries. He chalked up the crash to another illustration of how motorists are not obeying Michigan’s move-over law. Under Michigan law, motorists are required to move over when approaching any emergency vehicle, giving at least a one-lane buffer. When that is not practical, drivers have to slow down to a safe speed. Nelson pointed out the fire truck was off the road and as far out of the travel lanes as possible helping with a crash on the northbound side of the freeway. The fire truck was damaged, including a ladder that will have to be replaced. “She said her brakes failed, but again we were outside of the traffic lane in the emergency lane, so I’m not sure where she was traveling,” Nelson said. While that driver didn’t move over, Nelson said several other drivers also weren’t obeying the move over one lane law for emergency responders. “It took about 10 minutes before traffic was cleared enough for me to exit the apparatus out of the passenger side,” Nelson said. The accident happened just yards from where tow truck driver Tom Tripp was killed earlier this year, hit by a drunk driver as he was loading a car on a flat bed truck. A memorial has been set up near the crash site. Nelson said distracted driving is making the roads dangerous for everyone.